This pattern has not been tested, so any feedback is appreciated. Thanks! 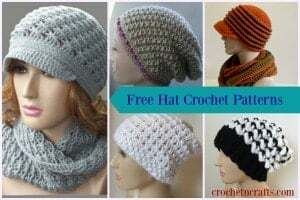 And here is a photo tutorial to show how to crochet the picot lace for this pattern. 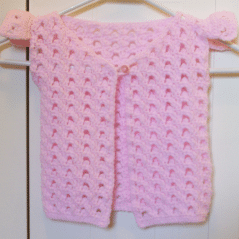 Crochet this with or without the ruffled shoulders. Personally I think it would look great without, but the choice is yours. Gauge: Measures 1 across 4 sts, and 4 rows. Finished Sizes: When laying flat, small measures 11 inches wide, and 12.5 inches long, and the large measures 13 inches wide, and 14.5 inches long. Picot: Ch 3, sl st on top of last sc made. Row 1: (WS) Ch 41, (49) sc in second ch from hook and in next ch, picot, *sc in next 4 chs, picot, repeat from * to last 2 chs, sc in last 2 chs. Turn. Row 2: (RS) Ch 1, sc in first st, *ch 5, sk next sc, sk picot and next sc,** sc in next 2 sts, repeat from * to last st, ending at **, sc in last st. Turn. Row 3: Ch 4, (counts as first tr), *(sc, picot, sc) in ch-5 lp,** tr in next 2 sc, repeat from * to last st ending at **, tr in last st. Turn. Repeat rows 2 & 3 another 13, (16) times, then repeat row 2 once. Next Row: Ch 4, (counts as first tr), *2 sc in ch-5 lp,** tr in next 2 sc, repeat from * to last st ending at **, tr in last st. Fasten off. Row 1: (WS) Ch 21, (25) sc in second ch from hook and in next ch, picot, *sc in next 4 chs, picot, repeat from * to last 2 chs, sc in last 2 chs. Turn. Repeat rows 2 & 3 another 10, (12) times, then repeat row 2 once. Row 1: Ch 4, (counts as first tr), *(sc, picot, sc) in ch-5 lp, tr in next 2 sc, repeat from * to last ch-5 lp, sc in ch-5 lp. Turn. Row 2: Sl st into first two tr sts, ch 1, sc in tr, *ch 5, sk next sc, sk picot and next sc,** sc in next 2 sts, repeat from * to last st, ending at **, sc in last st. Turn. Repeat Rows 1 & 2 another 2, (3) times. Next Row: Ch 4, (counts as first tr), 2 sc in ch-5 lp, *tr in next 2 sc, 2 sc in ch-5 lp. Fasten off. Row 1: Ch 1, sl st into ch-5 lp, ch 1, sc in same lp, tr in next 2 sc, *(sc, picot, sc) in ch-5 lp,** tr in next 2 sc, repeat from * to last st ending at **, tr in last st. Turn. Row 2: Ch 1, sc in first st, *ch 5, sk next sc, sk picot and next sc, sc in next 2 sts, repeat from * up to last picot, ch 5, sk next sc, sk picot and next sc, sc in next st. Turn. Next Row: Ch 1, sl st into ch-5 lp, ch 1, 2 sc in same lp, *tr in next 2 sc, 2 sc in ch-5 lp, tr in last st. Fasten off. Place right sides together and sew shoulder seams. Sew side seams leaving enough room for the arms, about 4.5, (5.5) inches for the armholes. Row 1: With right side facing you, count 5 sts to the right of the shoulder seam. Join yarn to 5th stitch, ch 1, sc in same st and in next 9 sts. (you should have 5 sts on both sides of the outside shoulder seam). Turn. Row 4: Ch 1, sc in first 2 sts, picot, *sc in next 4 sts, picot, repeat from * to last 2 sts, sc in last 2 sts. Turn. Row 5: Ch 1, sc in first st, *ch 5, sk next sc, sk picot and next sc,** sc in next 2 sts, repeat from * to last st, ending at **, sc in last st. Turn. Row 6: Ch 4, (counts as first tr), *2 sc in ch-5 lp,** tr in next 2 sc, repeat from * to last st ending at **, tr in last st. Turn. Row 7: Ch 1, sc in each st across. Fasten off. Join yarn to any stitch and sc evenly around working 3 sc in each corner st. Fasten off. Do this as well for the shoulder openings. Chain 8, join with sl st to first ch, fasten off. Sew button on the right side of the top left, just below the neck shaping. Attach the button loop on the wrong side of the corresponding right side just below the neck shaping.